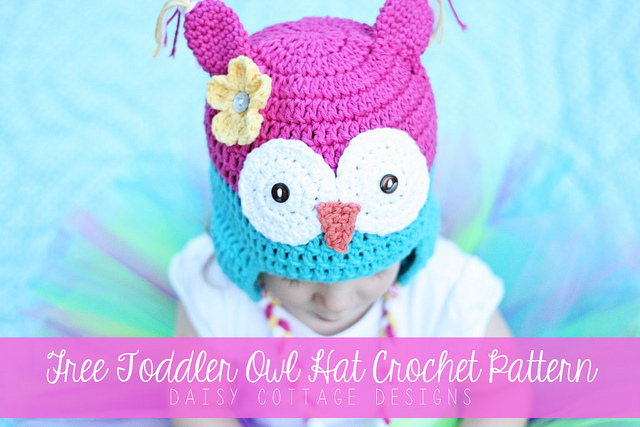 It doesn’t get much cuter than this crochet Toddler Owl Hat from Daisy Cottage Designs! Owls have been trendy for quite a while and this hat is a cute and clever way to wear them. The bright colors are perfect for this time of year – it’s still cold enough to need a hat, but really we’re all thinking about spring. This pattern is designed to fit a toddler, but you could easily alter it to fit a baby or even an adult! (Matching mom-and-daughter hats, maybe?) If you work this free crochet hat pattern up in neutrals and leave off the flower, it would be perfect for a little boy, too. Does anybody have recommendations for computer programs software where I can create patterns for crochet & Filet?